A Free-flow system featuring a T304 stainless steel construction with mandrel-bent tubing, stainless band, muffler and polished tips. Add personality to your car with a deeper tone that’s overall louder and more aggressive while adding horsepower and torque. 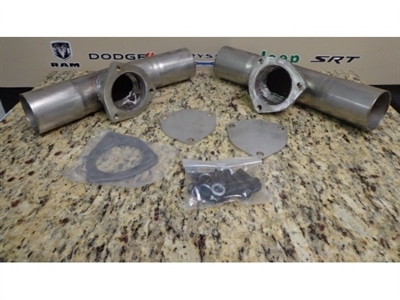 Exhaust Adapter Kit for for customers who want to install "side exit" exhaust systems. Contains two adapter pipes (Left & Right) with welded flanges to accept customer supplied side exit exhaust pipes and tips. For use with Mopar Cat-Back Exhaust System P5160040AB.